“Welcome to the sunshine city!” Cherry stared forlornly at the big placard. Tucson certainly deserved its nickname, but there was nobody at the Municipal Airport to welcome here. The waiting room, a glass-fronted portion of three huge hangars, made her feel as though she were surrounded by miles and miles of planes. After a while she wandered over to a bench and sat down with her suitcase and coat at her feet. What could have happened to Kirk? When Cherry had left her home in Hilton, Illinois, it had been snowing hard. And when she boarded the plane in Chicago that morning, she had been grateful for the warmth of her interlined coat. But now, here in Arizona, although it was five o’clock on a Sunday afternoon in late February, she was almost too warm in her smart red flannel suit and wished she had worn her white Nylon blouse instead of a sweater. But she had been told that as soon as the sun dropped down behind the mountains the air would grow steadily cooler and so she had packed in her bag some twin sweater sets and a warm sports jacket. 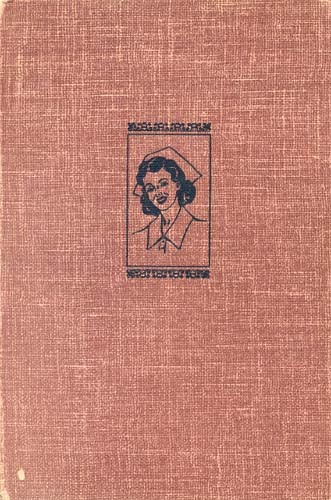 In the bat, too, were seven white uniforms and caps, a bathing suit, T-shirts, a bright checkered cowboy shirt which her twin brother, Charlie, had given her, blue jeans, donated by her father who said that in Arizona they were called “Levis”; new, shiny riding boots, a gift from her mother, and from Cherry’s harum-scarum young neighbor, Midge Fortune, an atomizer containing Cherry’s favorite brand of perfume.